Rain, rain go away, comeback next Tuesday (or so). Fortunately we have had most of our rain fall in non-work hours but it certainly has complicated the weeks scheduling because the, now nearly three inches of, water has made it impossible to get things planted, weeded or mowed. This was supposed to be pepper planting week, one of the most important of the year. We have managed to get the field ready with fabric and preparing the no-till section but not a single plant has gone in the ground. Hopefully some will get planted tomorrow. In any event it is the season for picking fussy little things. When Sugar Snap Peas and Blueberries happen at the same time we seem to just go from one to the other trying to keep up with the rapid ripening of thousands of individual fruits. Picking tomatoes and peppers is so much less tedious and the boxes fill so much faster. 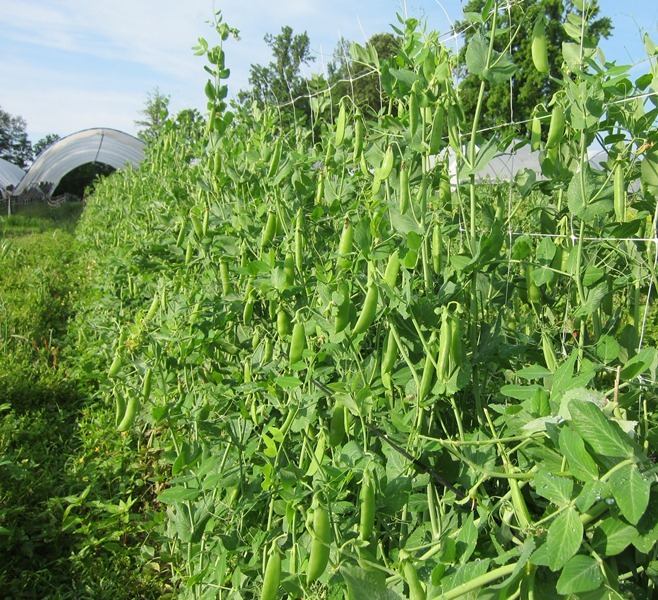 There are good aspects to peas and berries though, they are both stand up jobs, of which there are few on the farm, and usually the weather is pleasant as you keep your hands moving as fast as possible to get as many of the tiny objects into the bucket as you can. Of course there is the mandatory taste testing that happens too. There are tomatoes to tie up, flowers to trellis, winter squash to plant but we did finally get the ginger planted indoors yesterday. When it does dry out the weeds will be of biblical proportions and the mowing required will be Herculean. So after getting the peppers in the ground we know what we will be doing next week. Don’t forget the Farm to Fork picnic this Sunday, we are paired with Seth Kingsbury from Pazzo doing a torn Lacinato Kale salad with the Chinese Radishes. The weather looks perfect. Blueberries, this is the peak week and it looks like there will be much fewer to pick next week. The best Sugar Snap Peas at the market, you must come by and try one to see what we mean. Lacinato Kale, deep green and tender. Still lots of amazing succulent Spinach. Plenty of beautiful Lettuce but it is beginning to change with the season with the crispy and sweet Summer Crisp in Red and Green, Green Boston too. Round red Radicchio and tall green Sugarloaf Radicchio too. Beets in all three colors- Red, Golden and the striped Chioggia. Radishes only the spicy long Chinese. Some beautiful Delphiniums this week. The fragrant Oriental lilies are back. It is Spuria Iris season, the huge beautiful iris with multiple buds in a range of colors, a great flower. A few more fragrant Stocks. Amazing tall Larkspur. Beautiful Bouquets! Maybe a few other surprises that spring can bring.